An illustration of the molecular structure of graphene nanoribbons produced by UCLA scientists. Silicon — the shiny, brittle metal commonly used to make semiconductors — is an essential ingredient of modern-day electronics. But as electronic devices have become smaller and smaller, creating tiny silicon components that fit inside them has become more challenging and more expensive. 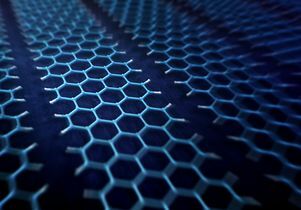 Now, UCLA chemists have developed a new method to produce nanoribbons of graphene, next-generation structures that many scientists believe will one day power electronic devices. This research is published online in the Journal of the American Chemical Society. 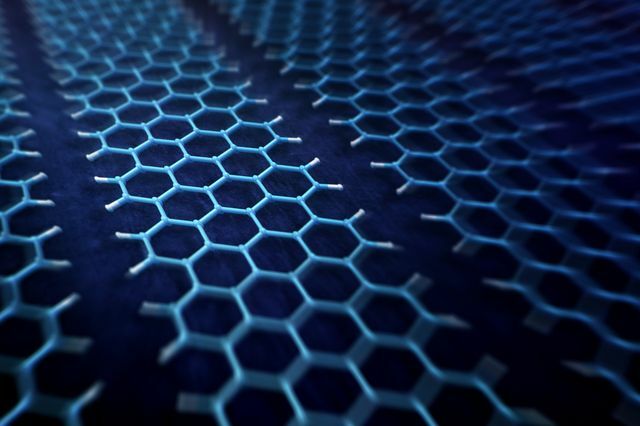 The nanoribbons are extremely narrow strips of graphene, the width of just a few carbon atoms. They’re useful because they possess a bandgap, which means that electrons must be “pushed” to flow through them to create electrical current, said Yves Rubin, a professor of chemistry in the UCLA College and the lead author of the research. “A material that has no bandgap lets electrons flow through unhindered and cannot be used to build logic circuits,” he said. Rubin and his research team constructed graphene nanoribbons molecule by molecule using a simple reaction based on ultraviolet light and exposure to 600-degree heat. “Nobody else has been able to do that, but it will be important if one wants to build these molecules on an industrial scale,” said Rubin, who also is a member of the California NanoSystems Institute at UCLA. 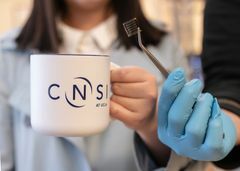 The process improves upon other existing methods for creating graphene nanoribbons, one of which involves snipping open tubes of graphene known as carbon nanotubes. That particular approach is imprecise and produces ribbons of inconsistent sizes — a problem because the value of a nanoribbon’s bandgap depends on its width, Rubin said. To create the nanoribbons, the scientists started by growing crystals of four different colorless molecules. The crystals locked the molecules into the perfect orientation to react, and the team then used light to stitch the molecules into polymers, which are large structures made of repeating units of carbon and hydrogen atoms. The scientists then placed the shiny, deep blue polymers in an oven containing only argon gas and heated them to 600 degrees Celsius. The heat provided the necessary boost of energy for the polymers to form the final bonds that gave the nanoribbons their final shape: hexagonal rings composed of carbon atoms, and hydrogen atoms along the edges of the ribbons. “We’re essentially charring the polymers, but we’re doing it in a controlled way,” Rubin said. The process, which took about an hour, yielded graphene nanoribbons just eight carbon atoms wide but thousands of atoms long. The scientists verified the molecular structure of the nanoribbons, which were deep black in color and lustrous, by shining light of different wavelengths at them. 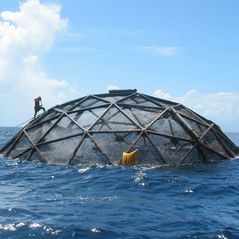 The researchers have filed a patent application for the process. Rubin said the team now is studying how to better manipulate the nanoribbons — a challenge because they tend to stick together. 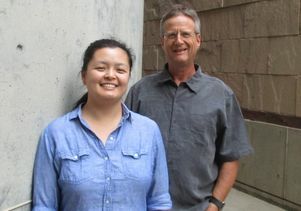 The study’s co-authors include Richard Kaner, a UCLA distinguished professor of chemistry and biochemistry, and of materials science and engineering; Kendall Houk, UCLA’s Saul Winstein Professor of Organic Chemistry; Robert Jordan, a former UCLA graduate student; UCLA graduate students Yolanda Li, Cheng-Wei Lin, Janice Lin and Kris Marsh; and Ryan McCurdy, a UCLA undergraduate student. Yolanda Li and Yves Rubin at UCLA.